On any given day, Asia Writes, an “up-to-date resource for writers in the Asia Pacific region or of Asian origin”, receives hundreds of calls for submissions from literary journals, both print and online. These they tweet or post for their “followers” — not members of some terribly secretive and archaic cult, but aspiring writers living in the region and beyond. The network may not yet be immense (about 3,000 plus on Twitter and Facebook) but it’s rapidly growing, accurately reflecting how propagative the journal scene is. You only have to browse the ‘Opportunities’ section of the Asia Writes Web site, which provides listings and links, to see how ‘small magazine’ publishing is flourishing. There’s a heady profusion of them worldwide — a Google search for ‘literary journal’ runs into millions — and in India too things seem to be warming up nicely. Literary magazines, or ‘small magazines’ (not meant as a pejorative but as a means to distinguish them from big-business, commercial magazines), have been in circulation in the UK, where they first appeared, since the 1800s. The Edinburgh Review, for example, was founded as early as 1802 (its Web site offers a downloadable PDF file of the very first issue), followed by the Westminster Review in 1824 and, more famously, the right-leaning Spectator in 1828. In the United States, among the oldest and most prominent literary magazines are the North American Review (founded in 1803) and the Yale Review (1819). The latter, published by Yale University, included contributors such as Virginia Woolf, Robert Frost, Wallace Stevens, Eugene O’Neill, H.G. Wells and John Maynard Keynes. The movement gathered strength in the 20th century: Poetry Magazine, published in Chicago from 1912, has grown to be one of the world’s most well-regarded journals (it featured one of T.S. Eliot’s earliest, and most famous, poems, The Love Song of J. Alfred Prufrock); and even those who have only a passing interest in the literary world would be familiar with the London-based Times Literary Supplement that first appeared in 1902. The idea, of course, was to provide space for the marginalised, the new, the uncommon. And that could well be the agenda of all small magazines, no matter where in the world they are published: To promote literature — in a broad, all-encompassing sense of the word — through poetry, short fiction, essays, book reviews, literary criticism and biographical profiles and interviews of authors. In India, the small magazine gained strength in the culturally rich atmosphere of the 1950s and 60s in a movement to publish literature in regional languages. In Bengal, there was an invigorating, small magazine culture, beginning with Kallol, published in 1923 by a group of young writers including Premendra Mitra, Kazi Nazrul Islam, and Buddhadeb Basu. It was followed by journals such as Kabita and Parichay. Yet, the truly exciting period was the early 1960s, the time of the Hungry Generation, a literary movement launched by Shakti Chattopadhyay, Malay Roy Choudhury, Samir Roychoudhury and Debi Roy. This group challenged accepted norms of expression, opting for experimental content and forms. The movement had wide-reaching consequences, influencing Hindi, Marathi, Assamese and Urdu literatures. The 1970s saw the “Kaurab cult” with the publishing of the cultural magazine Kaurab. A number of cult figures, such as Swadesh Sen, Kamal Chakraborty, Barin Ghosal, Debajyoti Dutta, Pranabkumar Chattopadhyay, Shankar Lahiri, Shankar Chakraborty and Aryanil Mukhopadhyay (the current editor), are associated with it. Little magazines continue to play an important role today in preserving indigenous literature and providing a platform for regional writers. It is not the same, however, in English magazines. Their history has been more slow and sporadic. In the 1960s, there was Poetry India, where Nissim Ezekiel was editor (1966-67). New Quest, a quarterly journal of literature and culture, was launched in 1977, and in the late 1980s, The Quest, an English journal showcasing criticism and essays on Indian writing in English and regional languages, was launched. Yet, it cannot be denied that their numbers are rising. Antara Dev Sen’s The Little Magazine, devoted to essays, fiction, poetry, art and criticism, has been running since 2000. 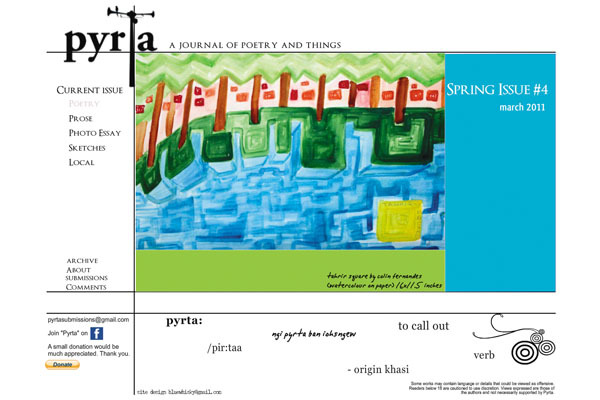 Kritya, an international journal of contemporary Indian and world poetry, published its first issue in June 2005, as did Muse India, an e-journal with the objective of showcasing Indian writings in English and in English translation. Nether, a quarterly magazine for English literature from Mumbai, was launched mid-2010. Most recently, we have Reading Hour, which began in January 2011. It is a bi-monthly magazine for short stories, poetry, essays, book reviews and more, primarily by freelance Indian authors. Yet how, if at all, are small magazines significant in the Indian literary scene? 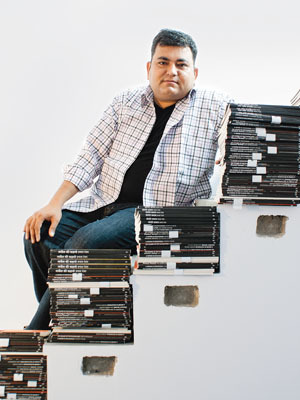 As Rahul Soni, co-founder and co-editor of Pratilipi, a bilingual online literary magazine, says, “New media platforms make it possible for newer sorts of writing to find a voice, an audience, to take risks that established publishing houses with their overheads and bottom lines may shirk.” This might explain why the greatest impact small magazines have had in India is on poetry: Mainstream Indian publishing houses have a diminished, and dwindling, poetry list. Anindita Sengupta, a Bangalore-based poet, says it’s only novelists who have literary agents and publishing houses “running after them”. 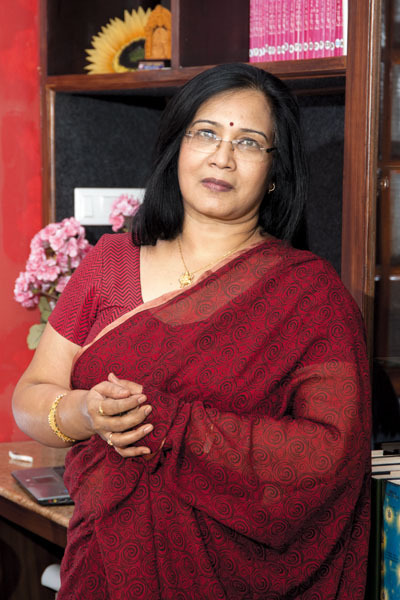 Sumana Roy, a writer based in Siliguri, who “[grew] up on a literary diet of Bangla little magazines of various kinds”, thinks that it is only in the pages, real or virtual, of such magazines that poetry, for one, will survive. Apart from that, upcoming writers are also given a platform to share their short stories, graphic stories and experimental fiction alongside established names. From the selection process involved, it’s clear that small magazines are willing to push literary boundaries. Ambika Ananth, editor of Muse India, says she prefers contemporary everyday realities and insightful social observations to narratives that are “trying the tried and hitting the hit”. At Out of Print, founding editor Indira Chandrasekhar says their story choices are informed by the issue of living in an era of intense and accelerated transition that may destroy the diverse, yet common narratives that link us. Although only two issues old, it has featured a fine selection of stories including pieces by Mridula Koshy and Anjum Hassan. Pratilipi, around since 2008, has a long, illustrious list of more than 350 contributors from 25 languages, including Keki Daruwala, Rana Dasgupta, Ashis Nandy and Indira Goswami. According to co-editors Soni and Giriraj Kiradoo, “At the end of the day (or night), we look for voices that engage us, writers dealing with their language and content without the mediation of dominant ancestral or contemporary voices — qualities, therefore, of freshness, vitality and essentiality.” The third issue of my own publication Pyrta has featured one of Vietnam’s most well-known poets Nguyen Quang Thieu alongside young, upcoming names such as Himali Singh Soin, Arielle Nelson and Arka Mukhopadhyay (recipient of the Toto Funds the Arts Creative Writing Award 2008). The Internet has drastically changed the dynamics of print publishing, providing relatively cheap cyber space and introducing ‘print-on-demand’ services. More and more little magazines are now launched via a Web site, and perhaps foray into print later, if at all. The Web makes for easier production and dissemination, making online publishing more sustainable. Sustainability is easier online, but there is also the issue of quality control: Cheap virtual space is more prone to mediocre, sub-standard writing. Although, journals, as compared to say, personal blogs, offer curated content, practically anyone with little or no experience can style themselves ‘editor’ of an online literary space. The Internet-powered surge has coincided with a rise in sub-cultural spaces in various urban centres like Yodakin in New Delhi, which stocks independently published and produced books, music and art. Alternative groups such as Madness Mandali in Mumbai, comprise amateur and professional poets, painters, designers, photographers, musicians and theatre troupes who invite people who “don’t think straight… intentionally”. There is a profusion of open mike events in various cities, not to speak of a flurry of literature festivals. All these provide a sense of community for writers. They also provide word-of-mouth information, an informal platform and distribution network for small magazines, which usually cannot afford to pay for advertising and publicity. But does this rapid rise in our access to ‘alternative’ literature herald a burgeoning English literary scene in India, similar to the one in America a few decades ago? Not at this point perhaps. Indian small magazines in English are still niche, their readership does not begin to rival that of bestselling novels; they haven’t yet garnered the respect and literary authority and quality that, for example, The Paris Review, demands. Small literary magazines don’t have much of a life expectancy. Many fell by the wayside, more victims to financial constraints than to the ravages of time. But many new ones spring up, inspired by pretty much the same reasons as their predecessors in other countries, regions and centuries: A labour of love for the written word, with the editors putting themselves out of pocket, not to mention the time and passion each issue demands. It is difficult to harness high quality writing or artwork for a literary magazine as contributors are largely unpaid. Yet, somehow, these tenacious little magazines continue to be sustained, whether through windfall luck or sheer will power. Yet, against all odds, and despite world wars, economic crashes and recessions, dwindling readership and worthy contributors, they endure. It is difficult to offer a well-rounded, comprehensive analysis of the impact of small magazines in English on the Indian literary scene. All that can be said is, they’re young, vibrant, enthusiastic and helping to generate a national, and sometimes even international, network of creative people. That clichéd stuff about labours of love? At times the two don’t go together, labour and love. There are nights when I scowl into the computer screen wondering why I do this. I hate it. It’s driving me mad. I need a cigarette. Then dawn breaks. The poetry page is done; it looks beautiful. And I’m in love again. Online literary journal editors are horrendously fickle. When people ask me why I started Pyrta, I try and think of a fittingly wholesome and noble reply. The truth? Well, they say writers write the books they want to read, I started Pyrta in July 2010 for the same shallow, selfish reasons. I wanted a beautiful online space — not just in terms of content but also style — and I couldn’t find anything out there that I particularly liked. Seriously, though, Shillong, where I live, has a number of established authors including Kynpham Singh Nongkynrih and Robin Ngangom (both are editorial consultants for Pyrta), yet no platform for young, upcoming writers; we encourage young local writers to contribute. We edit their work and offer suggestions. It’s a small community, but it’s growing. Pyrta features work by people from across the country and the world. We’re trying to put together as many different voices as possible in the same space; like a small literary or cultural festival. We spread the word through social networks. Then the reading begins (we read every single submission), slotting submissions into ‘rejected’, ‘potential’ and ‘accepted’ piles. I do all the Web site design work, and inspirations are varied: Seasons, content, pets, Shillong streets and images from the ‘sketches’ section of the issue. Pyrta has also been super-efficient (at times) and organised a few informal poetry readings in 2010. We hope to see more of these events, especially because local wine goes very well with local poetry. What we’re most excited about, however, is going into print and bringing out a ‘best of the year’ collector’s edition, which we hope to do this summer. As they say, nothing quite like smelling the ink and actually turning pages. I’m a freelance writer who has to attend to a large number of deadlines to scrape a living, but I always make time for Pyrta. I don’t really have a choice seeing as our core team is a grand total of three (on a good day). Yet it’s more than just a collection of poetry, prose, photo essays, graphic stories and local morsels. It means I help people put their work “out there somewhere”, to be read and appreciated. Who knows what could happen next? Pyrta, like most small magazines, is all about possibility. Also, it has helped me stay healthy. My cigarette money is now spent on the monthly instalment I must pay to keep Pyrta up and running. Now I cannot afford to smoke.